No`t so good condition for Walk around. Because A little bit rainy in this morning. We were quick breakfast and go! SAITO was eat good. May be still yang. As First, we were visited KYODO NEWS in Silom Complex Building. Mr.CHIKAZAWA (Chief Asian Correspondent) was came to Phuket at latest memorial service. I already met to him one time. And He have own opinion of Change day for Memorial service. Actually TSUNAMI Memorial day is 26/Nov, Event not easy to change to day of 5/Nov World Tsunami Awareness Day. Of course, It is no`t so easy. But in reality, more than ten years already and bereaved families are aging. Also, Every costs to high and most busy for every business in Phuket. Because 26/Dec is High Season in Phuket. Air Ticket from Japan, Hotel fare, everything…. It is so bad timing for invite to attendant. Most important thing from bereaved families. Keep mind of TSUNAMI Disaster and open memorial service. So, actually day 26/Dec, Only small memorial service still I`m open by my self. And This year will exchange friendship from ISHINOMAKI in JAPAN and Phuket. ISHINOMAKI Childrens will try Reaf Stamp and make Flag of Japan and Thai. Mr.CHIKAZAWA will back to japan soon, New person Ms.INOUE Introduction for us. I feel sad and want to next destination. Nest BANGKOK SHUHO in Silom. BANGKOK SHUHO has post about NPO PLAJA. But, Mr.Kurabayashi is not in office today. We visited and give to our original T-shirt of World Tsunami Awareness Day only. Lunch time with Mr.ISODA(Secretary General) of Japanese Association in Thailand. I have been met to him. But After start NPO PLAJA at first time. We hope advice for us, Because Japanese Association in Thailand have a lot of Experience and Achievements. We will be make good relationship with good lunch! What is different? 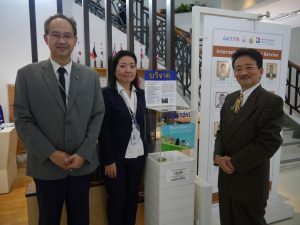 Japanese Association in Thailand and NPO PLAJA. Japanese Association is only for Japanese, And NPO PLAJA is International exchange from Any kind People. But We do`t Know how to do? So, Japanese Association in Thailand is Big man! They have good idea for us. We shot again with our original T-shirt of World Tsunami Awareness Day.